My Path is my latest project for Ironhack UX bootcamp. We had the freedom to choose whatever we wanted to develop and I started to look for something that would be meaningful and useful for people. I began to focus on career paths and problems I have faced with career advisors from my own personal experience, which led me to choose this route. To kick-start the research, I surveyed 30 students whose results revealed a common problem: they knew the future careers that they wished to pursue, but they did not know how to evolve within them. The interviews were key because we noticed that there was a lack of information given to students. The majority of career advice websites only gives quality information about the career you are looking for but they do not go into detail about how you can keep developing once you start your career. They only show the tip of the iceberg instead of something more complex and rewarding. 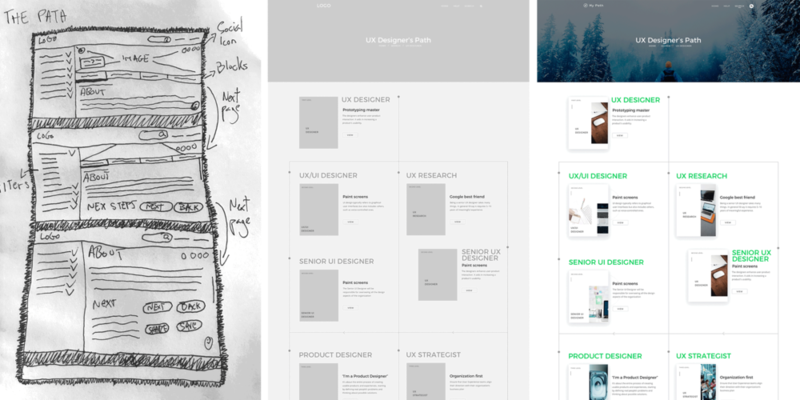 The benchmark confirmed that there was an opportunity to improve what I found in other career advice websites, so I built the UX strategy for the project. The challenge was to differentiate this service through a specific type of user experience that would drive adoption. More importantly, to consider how I would make an impact on our users’ work and daily lives. Tools like Strategy Blueprint as well as the surveys and interviews gave me the vision to empathize with this kind of user. 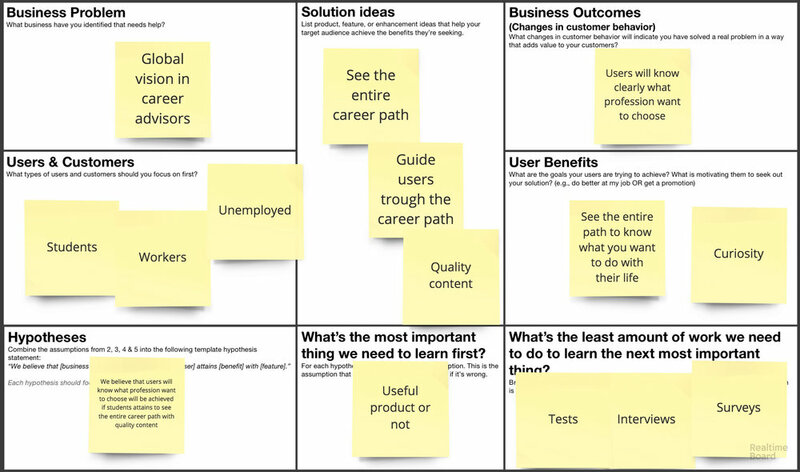 Tools such as Lean UX Canvas, Empathy Map and Affinity Diagram helped me to frame my research as a business problem to solve and then the ability to dissect this business problem into its core assumptions. I needed to identify that data in order to find key insights and patterns. 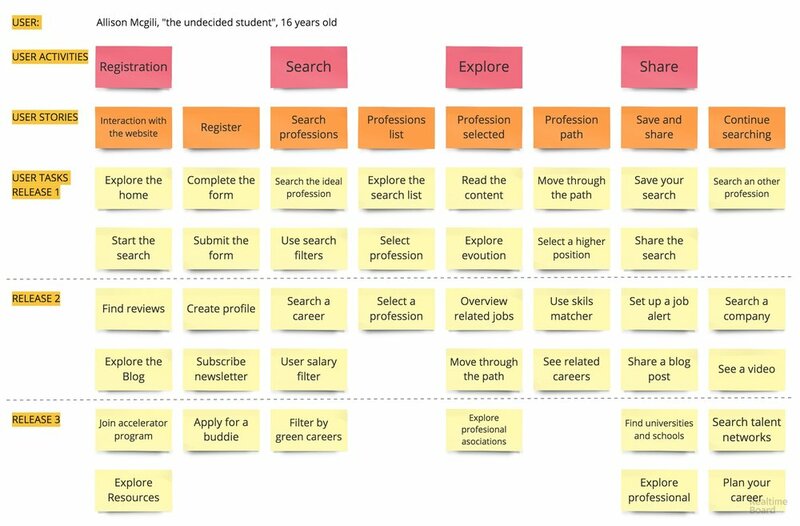 Mapping and grouping concepts gave me more ideas for the proposed challenge as well as a deeper understanding into the world of career advice. I could envision how the app might look through the User Stories. I wanted to keep the product user-focused to avoid holes in my prototype and feature creeps. The website Information Architecture helped me to frame the project scope. The goal of this primary level of navigation was for users to be able to explore the path, save, and share it. Organizing items into logical groups helped me to understand the users’ mental models and recognize how they organize and understand different career paths. The design of the first Prototype of the path was based on books with alternative endings where readers could choose how to continue the story. The results of the user task tests were negative because users could move systematically through the path but they couldn’t see the whole path, which was the main purpose. I had to go back to research other design patterns that fitted this objective. Iterating over the prototype gave me a new opportunity and I found a better way to display the entire path, as inspired by art gallery websites. Finally, I designed a computer-based interactive representation of the product in its closest resemblance to the final design in terms of details and functionality to validate into usability testing of the product. My Path was defined by iterations and user testing tools. It has been a very special project and I hope that one day it can serve as a valuable tool for users and Human Resources business functions. If you have any question about it don’t hesitate to drop me a line and we can take it from here.